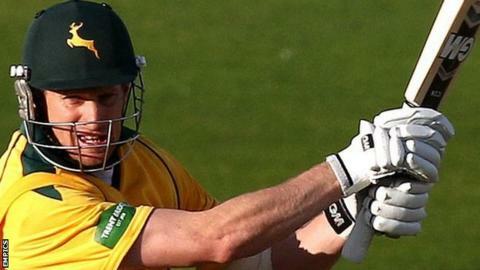 Nottinghamshire's Twenty20 captain Adam Voges says aggressive bowling by his side is the key to success this season. Notts begin this season's campaign at champions Leicestershire on Tuesday, with Derbyshire, Lancashire, Yorkshire and Durham also in their group. Voges, 32, told BBC Radio Nottingham: "Bowling is huge. We are going to be really aggressive with the ball. "In Andy Carter, Darren Pattinson and Harry Gurney, we've got three lads who can bowl with decent pace." Voges continued: "I am going to be looking to them to be quite aggressive, particularly up front. "It is a bit of a cliché but taking wickets is the best way to slow the run rate. "We will certainly be looking forward to the guys executing their skills as much as they possibly can. "In the spin department we have Samit (Patel) early on but we will probably lose him [to international duty], so Graeme White will play a big role for us." As in recent seasons, club captain Chris Read is taking a break from the role. In previous years David Hussey took up the role as skipper, although Voges was handed the job at the back end of last season's tournament. "I loved the opportunity last season to captain, so when Mick [Newell] rang and wanted me to do the job again, I jumped at the opportunity," he said. "It is going to be fast-paced but I am looking forward to it." Notts have never won the competition but have reached Finals Day twice in the tournament's previous nine years. "There's plenty of incentive in the competition with the Champions League at the end of the tunnel. "We've recruited really well with guys likes Lumb, Taylor and Gurney who are very, very good at the shorter form of the game. "We are hoping those guys come in and make a really big impact and if we can perform similar to last year we will give ourselves a chance of getting to the final stages," Voges added.